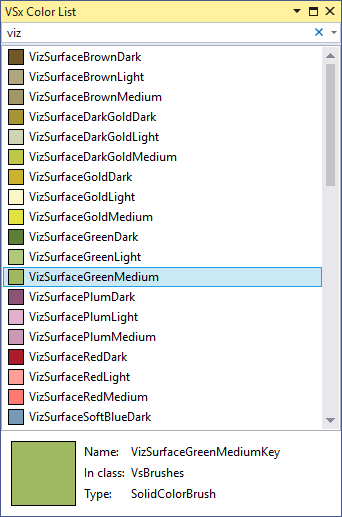 Tool window which lists all available colors, that Visual Studio Extension developer can use. Tool window which lists all available colors, that Visual Studio Extension developer can use. All colors are available in VsBrushes or VsColors classes as described in details for each color. In code behind you retrieve color for example by FindResource method which is available on every WPF control. In XAML you need to add import of Microsoft.VisualStudio.Shell namespace and then you can use color using StaticResource from that namespace. For example put this atribut to root element in XAML. This extensions show list of all available colors that you can use with the preview how the color looks like.